Kaitlynn began practicing yoga at her campus rec center in college, but it wasn't until she traveled to India in 2008 that she began to understand the many aspects of yoga and its importance in her life. Inevitably, she learned it's more than a physical practice, and ultimately goes beyond a mental exercise, and now it's a whole life practice, moment to moment, and the spaces in between. Kaitlynn likes to create class environments where students feel comfortable learning their own strengths and weaknesses, and giving students a chance to be in collective stillness. She's happy to share yoga with anyone who asks and she's excited to grow with the yoga community in Plymouth. In her free time Kaitlynn enjoys plant life, cooking and making preserves, playing and listening to music, and spending time outside. Sue began her yoga journey in 2001. It was after she suffered a severe hip injury that the physical benefits of yoga became obvious to Sue. Along with physical benefits, came the mental and spiritual benefits that changed Sue's life for the positive! It also began her belief that "anyone can do yoga". This was the foundation for Real Yoga, the studio Sue began in 2007. In 2014, Sue sold Real Yoga to Kaitlynn Kiela and it became Plymouth Yoga. Years later, the fundamental belief that "anyone can do yoga" is still the philosophy for all the teachers at Plymouth Yoga. Sue has studied a variety of yoga styles with many amazing teachers. Her favorite styles include Vinyasa and Yin Yoga. She received her certification in 2007 from Midwest Power Yoga. Sue lives in Plymouth with her husband and two dogs. She has two grown children who are both beginning their own adult journey. Her hobbies include gardening, reading and being active! Chris began practicing yoga in 2000 at the Sports Core in Kohler. What started out as just another physical challenge soon became so much more! She learned that yoga is a practice for not only the body, but the mind and spirit as well! As a busy wife and mom, she often felt scattered. Through the practice or yoga she became more relaxed, grounded and happy. Chris believes that all people can practice yoga and benefit from it, regardless of their age or physical ability. It can range from very physically challenging to very gentle and restorative. The physical benefits of strength, flexibility and balance are complimented with the mental and spiritual benefits of calmness, acceptance and awareness. She would love to have you join her in discovering yoga for yourself! Chris teaches several styles of yoga including Vinyasa, Yin, Hatha, Restorative and SUP(Stand Up Paddle) yoga.Chris lives in Plymouth with her family and enjoys spending time with her husband, children and dog at their cottage. Jenny has been practicing yoga since 2000 and teaching since 2011. She appreciates the strength and calm yoga brings to her mind and body. With a background in massage therapy, she integrates the two modalities emphasizing optimal alignment and compassionate self-care techniques. As a social worker, Jenny worked in a nursing home setting and with children and families in international adoption. She offers yoga classes to all ages, from toddlers to senior citizens. Jenny owns The Healing Table massage therapy, located at the Plymouth Yoga studio. In her spare time she enjoys being in the outdoors with her amazing husband, two beautiful daughters, and dogs. Stacey has been drawn to yoga since as long as she can remember and began practicing in 2008. Since then yoga has become a practice of self-awareness, physical challenge, inner healing, and a place of deep rest. Stacey believes that yoga is an endless path of self-discovery and transformation and recognizes that each one of us has our own unique story that brings us to the present moment. Starting from this place, she strives to lead students towards a path of self-acceptance by creating a space that explore asana, breath work and imagery. 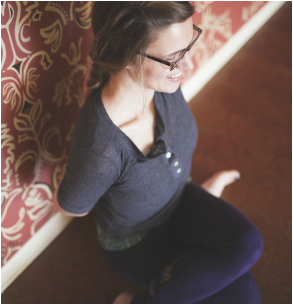 Stacey offers restorative, gentle, and vinyasa based classes. She loves nature and spending time with her husband, two cats, and dog. Kathy started her yoga journey in the late 90’s. She has practiced a variety of different mind- body movements which include; Hatha Yoga, Yin Yang Yoga, Ashtanga Yoga, Feldenkrais, Kundalini Yoga and Yoga Nidra. In 2016 she completed a 200 hour teacher training at YogaLoft in Sheboygan. The most valuable lesson for her in any yoga practice is connecting to her inner peace. This is evident in her classes as she guides students into proper alignment and then allows the space for inner exploration. Kathy enjoys spending her free time with her husband, gardening or just being outside. Kim was introduced to yoga in 1998. I practiced on and off for several years. In 2016 I became very serious about improving my health. By the end of that year I was practicing yoga five days per week. My physical health as well as my mental health had improved greatly. By the end of 2017 I started practicing yoga seven days per week and made the decision to get my yoga teacher certification. I strongly believe in the health benefits of yoga and would like to share this experience with others. Originally from Chicago, my husband and I moved to Milwaukee in 1986 and then to Plymouth in 1992. We have two grown sons that we try to see as often as possible. My husband and I enjoy travel and spending summers at our cottage in northern WI.